Cameron Trout and Kelsey Brooks paid respects at a memorial for slain teacher Colleen Ritzer after a grief counseling session at Danvers High School on Thursday. 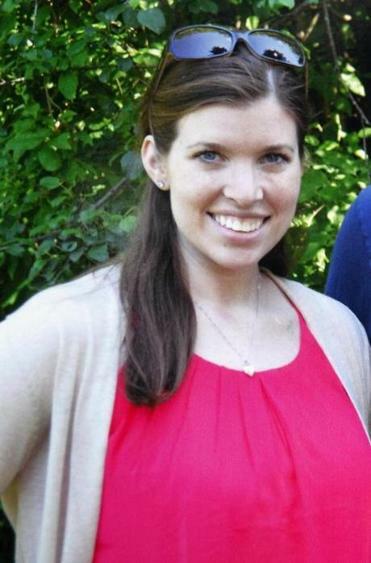 DANVERS — On the day she died, math teacher Colleen Ritzer had asked the 14-year-old student accused in her slaying to stay after school so that she could help him prepare for a test, students said Thursday. Ritzer, whose body was found in the woods behind the school Wednesday morning, made the request to Philip Chism when she saw him drawing during class, a student said. After Ritzer first noticed the sketching, she remarked matter of factly, “I didn’t know you could draw,” Rhaedaoui said. Another student saw the tall, lanky teenager still in Ritzer’s classroom more than an hour after the class, the last of the day, ended shortly before 2 p.m. Tuesday. At 24, Ritzer had become a role model for many of her students at Danvers High School. As Danvers High School reopened Thursday morning to provide grief counseling to students and families, and as hundreds of parents gathered for an evening meeting with police and school officials, the accounts provided new details of the final hours of Ritzer’s life and evidence of a lengthy interaction with Chism, who has been charged with first-degree murder. He is being held without bail. Authorities have declined to divulge details of the case or discuss possible motives. “This is an active and very fluid investigation, and it is inappropriate for me to make any comments about the possible findings of that investigation while it is ongoing,’’ said Carrie Kimball Monahan, a spokeswoman for Essex District Attorney Jonathan W. Blodgett, whose office is overseeing the investigation. Not long after he met with Ritzer, Chism was seen running away from the soccer field, hurriedly telling teammates he had something he needed to take care of, said friends. Around 4:15 p.m., he arrived at a movie theater near his home and bought a ticket to a Woody Allen movie, “Blue Jasmine.” He was by himself in the theater. “He sat alone in Theater Two,” said Scott Przybycien, who manages the Hollywood Hits movie theater. Chism, dressed in a sweatsuit, did not buy concessions, Przybycien said. He left the theater around 6:15 p.m. and was later reported missing by a family member. He was found by police in neighboring Topsfield at 12:30 a.m. Wednesday, walking alongside Route 1. Police have not discussed his whereabouts in the intervening hours. A law enforcement official said Chism changed his clothes after the slaying. The official declined to speak for attribution because he was not authorized to discuss the case. After Ritzer was reported missing around 11:20 p.m., investigators searched the school and found blood in a second-floor bathroom. Her body was found a few hours later. Surveillance footage shows Chism pushing a large recycling bin through a hallway and outside the building, an official said. Investigators are trying to determine whether Ritzer’s body was inside. Outside the evening meeting at the school, which reporters were not allowed to attend, a memorial stretched along a sidewalk. Left in Ritzer’s memory were teddy bears, flowers, and candles. 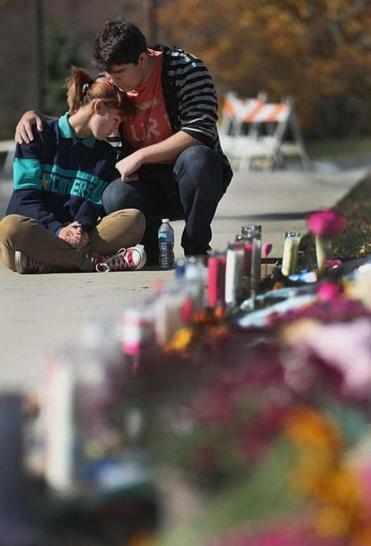 There were two pumpkins, one carved with the pi symbol, for Ritzer’s love of mathematics, the other with a heart. Alex Lapointe, 28, a lifelong resident who graduated from Danvers High, said he and his wife felt obliged to pay their respects. After the meeting, which lasted less than an hour, most parents left quickly and declined to speak to reporters. At a short press conference that followed, Chief Neil F. Ouellette of the Danvers Police Department said about 800 to 900 parents had attended, along with representatives from several faith-based organizations. Ouellette said that students will return to school Friday, but that the bathroom where Ritzer was killed will not be open for the foreseeable future. He said officials would reevaluate safety measures and policies at the school. “We will certainly be looking forward, reviewing those policies to see if there’s anything we could change or improve in relation to this incident,” he said. In the slaying’s aftermath, Ouellette said, Danvers officials had assistance from a School Threat and Response team made up of “police officers, crisis counselors, school administrators, and also firefighters” from the North Eastern Massachusetts Law Enforcement Council. While specifics about Chism’s background remained scarce, some details emerged. He lived with his mother and two sisters in Danvers, where the family moved this summer from Tennessee, a neighbor said. His father has no contact with Chism, according to his soccer teammates. The teenager’s parents, Diana and Stacy Chism, married in 1998 in Clarksville, Tenn., and filed for divorce three years later. But their divorce was never finalized, according to court records. Stacy Chism, 38, served in the Army National Guard in Tennessee from 1994 to 2002, the Army said. Friends said Chism seemed to make a good transition as a freshman in his new school and bonded quickly with his soccer teammates, although some students said he tended to keep to himself. Chism’s legal situation will be influenced by a 2012 Supreme Court decision, which struck down mandatory sentences of life without parole for juveniles. In court, Chism’s lawyer, Denise Regan, said the boy’s age raises an issue of his competence. Specialists said the high court’s ruling would affect Chism’s sentence, but not whether he can be tried as an adult. Joshua Dohan, director of the youth advocacy division for the Committee for Public Counsel Services, said it will be up to the Supreme Judicial Court and the Legislature to square the Supreme Court ruling with state law. Ritzer, 24, has been recalled by colleagues and friends as a caring and devoted teacher who had a natural connection with her students. In a statement, her family said they were grateful for “the outpouring of support during this very difficult time.” They requested privacy. At the high school, many students arrived in tears and said they were deeply shaken by her death. Sarah Roach, who was in Ritzer’s geometry class, said she hoped the counseling would make students feel more comfortable returning to school Friday. “I’m kind of nervous about going back to [Ritzer’s] classroom,” she said. Ritzer had a fun, light-hearted approach to teaching, she said. “She’d say things like ‘Yay! More proofs today!’” Roach recalled. Nicole White, a freshman who was in Ritzer’s geometry class, recalled her teacher as a sweet, gentle spirit. “She wanted the best for everyone,” she said. June McEachern arrived at the school with her son, Kyle, a sophomore. She said she did not know how to console her son through such a tragedy, and was looking for guidance. “What can you say to a child?” she asked. David Abel, John R. Ellement, Maria Cramer, and Jerry Manion of the Globe staff and Globe correspondent Jeremy C. Fox contributed to this report. Peter Schworm can be reached at schworm@globe.com. Kathy McCabe can be reached at katherine.mccabe@globe.com.